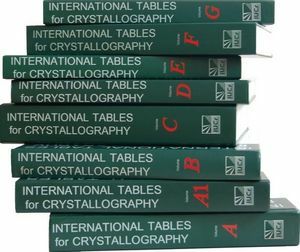 International Tables for Crystallography Volume F is an expert guide to macromolecular crystallography for the structural biologist. It was commissioned by the International Union of Crystallography in recognition of the extraordinary contributions that knowledge of macromolecular structure has made, and will make, to the analysis of biological systems, from enzyme catalysis to the workings of a whole cell. The volume covers all stages of a crystallographic analysis from the preparation of recombinant proteins, through crystallization, diffraction data collection, phase determination, structure validation and structure analysis. Although the volume is written for experienced scientists, it is recognized that the reader is more likely to be a biologist interested in structure than a classical crystallographer interested in biology. Thus, there are chapters on the fundamentals, history and current perspectives of macromolecular crystallography, as well as on useful programs and databases such as the Protein Data Bank. Each chapter is written by one or more internationally recognized experts. This second edition features 19 new articles and many articles from the first edition have been revised. The new articles cover topics such as standard definitions for quality indicators, expression of membrane proteins, protein engineering, high-throughput crystallography, radiation damage, merohedral twinning, low-resolution ab initio phasing, robotic crystal loading, whole-cell X-ray diffraction imaging and halogen interactions in biological crystal structures. There are also new articles on relevant software, including software for electron microscopy. These enhancements will ensure that Volume F continues to be a key reference for macromolecular crystallographers and structural biologists. 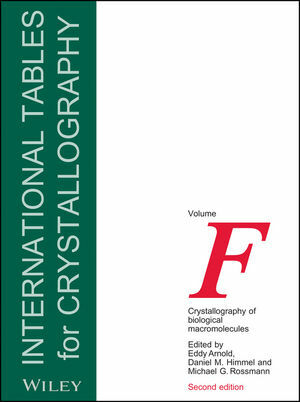 Eddy Arnold and Daniel M. Himmel are the authors of International Tables for Crystallography, Volume F, 2nd Edition, Crystallography of Biological Macromolecules, published by Wiley. Preface (M.G. Rossmann and E. Arnold). 1.1 Overview (E. Arnold and M.G. Rossmann). 1.2 Historical Background (M.G. Rossmann). 1.3 Macromolecular Crystallography and Medicine (W.G.J. Hol and C.L.M.J.Verlinde). 1.4 Perspectives for the Future. 2.1 Introduction to Basic Crystallography (J. Drenth). PART 3 TECHNIQUES OF MOLECULAR BIOLOGY. 3.1 Preparing Recombinant Proteins for X-Ray Crystallography (S.H. Hughes and A.M. Stock). 4.1 General Methods (R. Giegé and A. McPherson). 4.2 Crystallization of Membrane Proteins (H. Michel). 4.3 Application of Protein Engineering to Improve Crystal Properties (D.R. Davies and A. Burgess Hickman). PART 5 CRYSTAL PROPERTIES AND HANDLING. 5.1 Crystal Morphology, Optical Properties of Crystals and Crystal Mounting (H.L. Carrell and J.P. Glusker). 5.2 Crystal-Density Measurements (E.M. Westbrook). PART 6 RADIATION SOURCES AND OPTICS. 6.1 X-Ray Sources (U.W. Arndt). 6.2 Neutron Sources (B.P. Schoenborn and R. Knott). 7.1 Comparison of X-Ray Detectors (S.M. Gruner, E.F. Eikenberry and M.W. Tate). 7.2 CCD Detectors (M.W. Tate, E.F. Eikenberry and S.M. Gruner). 8.1 Synchrotron-Radiation Instrumentation, Methods and Scientific Utilization (J.R. Helliwell). 8.2 Laue Crystallography: Time-Resolved Studies (K. Moffat). PART 9 MONOCHROMATIC DATA COLLECTION. 9.1 Principles of Monochromatic Data Collection (Z. Dauter and K.S. Wilson). 10.1 Introduction to Cryocrystallography (H. Hope). 10.2 Cryocrystallography Techniques and Devices (D.W. Rodgers). 11.1 Automatic Indexing of Oscillation Images (M.G. Rossmann). 11.2 Integration of Macromolecular Diffraction Data (A.G.W. Leslie). 11.3 Integration, Scaling, Space-Group Assignment and Post Refinement (W. Kabsch). 11.4 DENZO and SCALEPACK (Z. Otwinowski and W. Minor). 11.5 The Use of Partially Recorded Reflections for Post Refinement, Scaling and Averaging X-Ray Diffraction Data (C.G. van Beek, R Bolotovsky and M.G. Rossmann). 12.1 The Preparation of Heavy-Atom Derivatives of Protein Crystals for Use in Multiple Isomorphous Replacement and Anomalous Scattering (D. Carvin, S.A. Islam, M.J.E. Sternberg and T.L. Blundell). 12.2 Locating Heavy-Atom Sites (M.T. Stubbs and R. Huber). 13.1 Noncrystallographic Symmetry (D.M. Blow). 13.2 Rotation Functions (J. Navaza). 13.3 Translation Functions (L. Tong). 13.4 Noncrystallographic Symmetry Averaging of Electron Density for Molecular-Replacement Phase Refinement and Extension (M.G. Rossmann and E. Arnold). 14.1 Heavy-Atom Location and Phase Determination with Single-Wavelength Diffraction Data (B.W. Matthews). PART 15 DENSITY MODIFICATION AND PHASE COMBINATION. 15.1 Phase Improvement in Iterative Density Modification (K.Y.J. Zhang, K.D. Cowtan and P. Main). 15.2 Model Phases: Probabilities, Bias and Maps (R.J. Read). 16.1 Ab Initio Phasing (G.M. Sheldrick, H.A. Hauptman, C.M. Weeks, R. Miller and I Usón). 16.2 The Maximum-Entropy Method (G. Bricogne). PART 17 MODEL BUILDING AND COMPUTER GRAPHICS. 17.1 Around O (G.J. Kleywegt, J.-Y. Zou, M. Kjeldgaard and T.A. Jones). 17.2 Molecular Graphics and Animation (A.J. Olson). 18.1 Introduction to Refinement (L.F. Ten Eyck and K.D. Watenpaugh). 18.2 Enhanced Macromolecular Refinement by Simulated Annealing (A.T. Brunger, P.D. Admas and L.M. Rice). 18.3 Structure Quality and Target Parameters (R.A. Engh and R. Huber). 18.4 Refinement at Atomic Resolution (Z. Dauter, G.N. Murshudov and K.S. Wilson). 18.5 Coordinate Uncertainty (D.W.J. Cruickshank). PART 19 OTHER EXPERIMENTAL TECHNIQUES. 19.1 Neutron Crystallography: Methods and Information Content (A.A. Kossiakoff). 19.2 Electron Diffraction of Protein Crystals (W. Chiu). 19.3 Small-Angle X-Ray Scattering (H. Tsuruta and J.E. Johnson). 19.4 Small-Angle Neutron Scattering (D.M. Engelman and P.B. Moore). 19.5 Fibre Diffraction (R. Chandrasekaran and G. Stubbs). 19.6 Electron Cryomicroscopy (T.S. Baker and R. Henderson). 19.7 Nuclear Magnetic Resonance (NMR) Spectroscopy (K. Wüthrich). PART 20 ENERGY CALCULATIONS AND MOLECULAR DYNAMICS. 20.1 Molecular-Dynamics Simulation of Protein Crystals: Convergence of Molecular Properties of Ubiquitin (U. Stocker and W.F. van Gunsteren). 20.2 Molecular-Dynamics Simulations of Biological Macromolecules (C.B. Post and V.M. Dadarlat). 21.1 Validation of Protein Crystal Structures (G.J. Kleywegt). 21.2 Assessing the Quality of Macromolecular Structures (S.J. Wodak, A.A. Vagin, J. Richelle, U. Das, J. Pontius and H.M. Berman). 21.3 Detection of Errors in Protein Models (O. Dym, D. Eisenberg, and T.O. Yeates). PART 22 MOLECULARY GEOMETRY AND FEATURES. 22.1 Protein Surfaces and Volumes: Measurement and Use. 22.2 Hydrogen Bonding in Biological Macromolecules (E.N. Baker). 22.3 Electrostatic Interactions in Proteins (K.A. Sharp). 22.4 The Relevance of the Cambridge Structural Database in Protein Crystallography (F.H. Allen, J.C. Cole and M.L. Verdonk). PART 23 STRUCTURAL ANALYSIS AND CLASSIFICATION. 23.1 Protein Folds and Motifs: Representation, Comparison and Classification. 23.2 Protein-Ligand Interactions (A.E. Hodel and F.A. Quiocho). 23.3 Nucleic Acids (R.E. Dickerson). 23.4 Solvent Structure (C. Mattos and D. Ringe). 24.1 The Protein Data Bank at Brookhaven (J.L. Sussman, D. Lin, J. Jiang, N.O. Manning, J. Prilusky and E.E. Abola). 24.2 The Nucleic Acid Database (NDB) (H.M. Berman, Z. Feng, B. Schneider, J. Westbrook and C. Zardecki). 24.3 The Cambridge Structural Database (CSD) (F.H. Allen and V.J. Hoy). 24.4 The Biological Macromolecule Crystallization Database (G.L. Gilliland, M. Tung and J.E. Ladner). 24.5 The Protein Data Bank, 1999- (H.M. Berman, J. Westbrook, Z. Feng, G. Gilliland, T.N. Bhat, H. Weissig, I.N. Shindyalov and P.E. Bourne). PART 25 MACROMOLECULAR CRYSTALLOGRAPHY PROGRAMS. 25.1 Survey of Programs for Crystal Structure Determination and Analysis of Macromolecules (J. Ding and E. Arnold). 25.2 Programs and Program Systems in Wide Use. PART 26 A HISTORICAL PERSPECTIVE. 26.1 How the Structure of Lysozyme was Actually Determined (C.C.F. Blake, R.H. Fenn, L.N. Johnson, D.F. Koenig, G.A. Mair, A.C.T. North, J.W.H. Oldham, D.C. Phillips, R.J. Poljak, V.R. Sarma and C.A. Vernon).